The Gentleman Crafter: Craft Day At Kay's and A Winner...Soon! Just wanted to pop in real quick and say....Craft Day Today at my friend Kay Pierce's House. We are going to get inky. Everyone wanted to play with Dylusions today, so, I've packed a HUGE suitcase full of inks, stamps, sprays and stencils and I'm heading out the door....Actually I'm late! 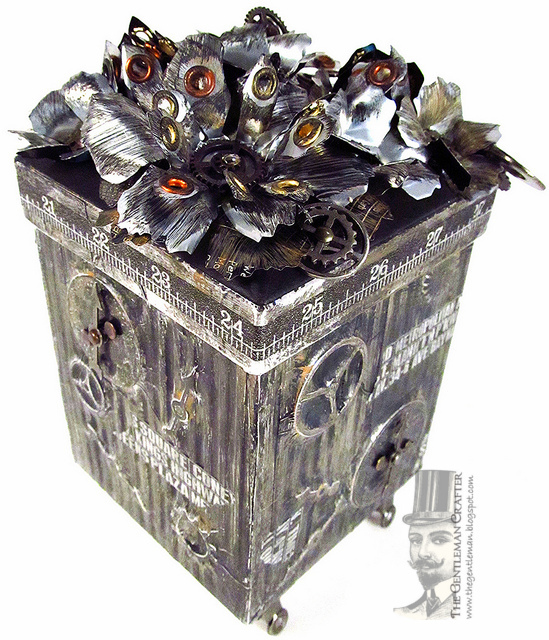 However...here's the cool part, this afternoon I will announce the winner of Tim's Tattered Floral Die and my steampunked Tattered Floral Box I picked from a random drawing yesterday.....Yahoooo! Thanks and see y'all this afternoon! I'm happy to report that I totally got my "Flossie" in with some mixed items & loved your post about random number Dy tag so I got a couple of things so thank you for posting via IE to get them. I'm looking forward to my personal Gentlemen Crafter Tag...Ooober excited! Wished I could be there with ya'll too. P.S. I'm going to do my best to make it up to your Tumwater event. It's only about a 10 hour drive for me but totally worth it if we get to spend time getting inky with ya. Sounds fun, have a great time!!!! have a great time, wish i lived in your country to stop by to see all the great things you made in real life. I'd love to see what you made today, Dylusions are so fun!! One of these days I'm going to show up on your doorstep with my own suitcase!! Have fun! Hope you had a super fun time! I can't wait to see who wins your beautiful treasure!!! I see you have another post, so I will be back!